In this article, we’ll go over the most effective ways to removing bird droppings from car. It’s pretty much unavoidable that at some point you’ll wind up with bird droppings on your car. It’s unsightly and unsanitary. It can happen anywhere, especially when you park near trees or places birds like to perch such as telephone wires, street lights, etc. 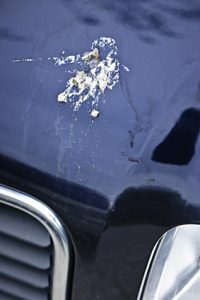 Unless you are there with cleaning supplies the moment it happens, you’re likely going to have to deal with cleaning dried bird poop off of your car at some point. is to go about cleaning your car off with soap and water just like you would when you clean it regularly. Focus the water on the bird droppings for a few seconds and wipe it clean with a soft towel or microfiber cloth. A small bit of soap will help with the removal process, as well. You’ll want to clean off the entire area of the car so that you’re not simply spreading the bird poop across the surface, instead, removing it entirely. It’s best to take a hands-on approach using this method as most drive-through car washes won’t be able to remove all of the bird poo. Alternatively, if you don’t have access to a hose or a free flowing water source, there are other options available. Take a clean microfiber cloth and fold it into a thick, small square. Spray one side of the microfiber cloth with whatever spray detailer you have handy. Place the cloth with the detailer coated side down on the dropping and apply a small amount of pressure. Wet the back side of the cloth down with whatever water you have available; a simple glass of water would do fine. Leave the cloth for approximately ten minutes. The idea is the spray detailer and water will break down the dried bird poop while lubricating it enough to easily scoop up. After ten minutes, you should be able to bunch up the cloth as if you were picking up the bird poop through the cloth. Avoid wiping down the area so you’re not spreading the dropping around. Finally, wipe the area with a clean, dry cloth. 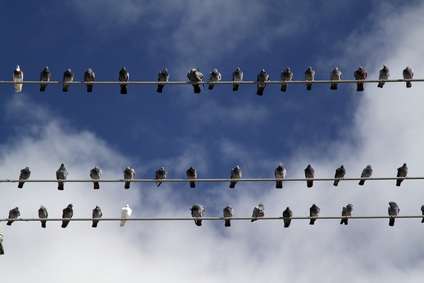 You shouldn’t notice any trace of the bird droppings left over! we’ll tell you one of the easiest ways involving club soda! If you don’t have access to a hose, car wash, or bottle of detailer, you can pick up a bottle of club soda from any supermarket. All you have to do is pour a bit of club soda over the affected area and give it a few minutes to soak in. You can use as much or little as you want; club soda is very gentle on your vehicle and won’t cause any problems unlike the acids in the bird poop. After a few minutes of the bird poop soaking, simply wipe it off (or, if it’s on your windshield, you wipers should be able to remove it). The carbonation helps to dissolve the bird droppings allowing an easy cleanup with traditional supplies. you’re able to use a wide variety of household cleaners such as glass cleaner. Just make sure that the product is safe for paint and clear coat so that you aren’t causing damage to your car. If the bird poo is on one of your windows, you can spray a few sprays of glass cleaner over it and wait a few minutes for the product to soak in. After a few minutes, wiping the area down with a clean cloth should be sufficient to remove all traces. You may need to go back over the area a second time in case the bird droppings spreads around instead of coming up easily. Alternatively, many car shops will sell specialty products to remove sap, bug splats, tar, etc. These products will work just fine for bird poop and are tested to be safe on clear coats and paint. Isopropyl alcohol, WD-40, etc. are also options if you don’t feel like visiting a store. Any question post them in the box below, thank you.